Reply, 'Mr Thos. Hall surgeon Berwick'. Concerns the cases of Mrs Moodie and her daughter, and mentions also that Cullen 'rejoice[s] in Ld Errol's recovery'. Dating based on this being the reply to ID:1460. Summary Reply, 'Mr Thos. Hall surgeon Berwick'. 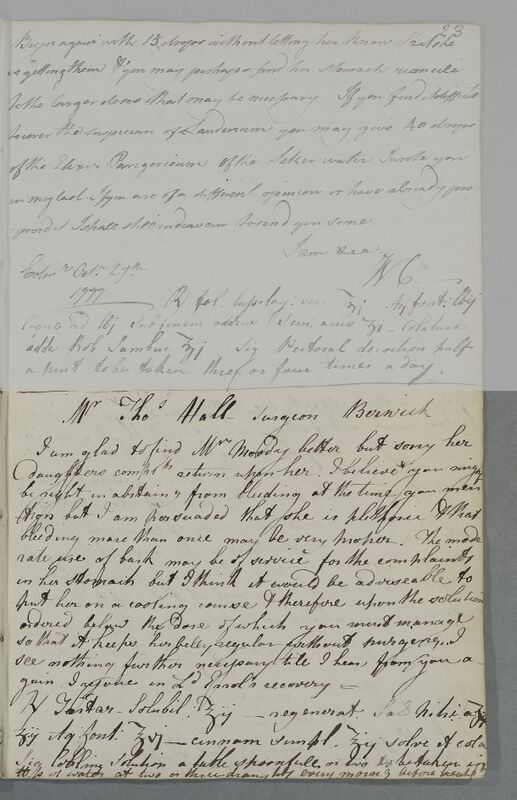 Concerns the cases of Mrs Moodie and her daughter, and mentions also that Cullen 'rejoice[s] in Ld Errol's recovery'. Dating based on this being the reply to ID:1460. Take two ounces of Soluble Tartar, two drachms each of Regenerated Tartar and nitrous salt, six ounces of spring water and two ounces of simple cinnamon. Dissolve and drain. Label: Cooling solution. A tablespoonful to be taken in half a pound of water at two or three draughts every morning before breakfast.